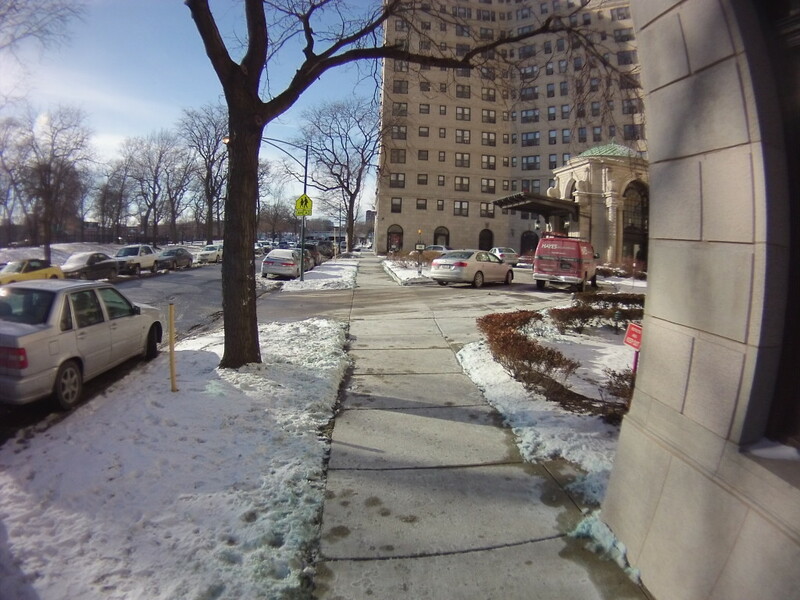 As pedestrian traffic is high throughout Hyde Park, each failure to clear a sidewalk places many people at risk of injury and making it difficult to travel. 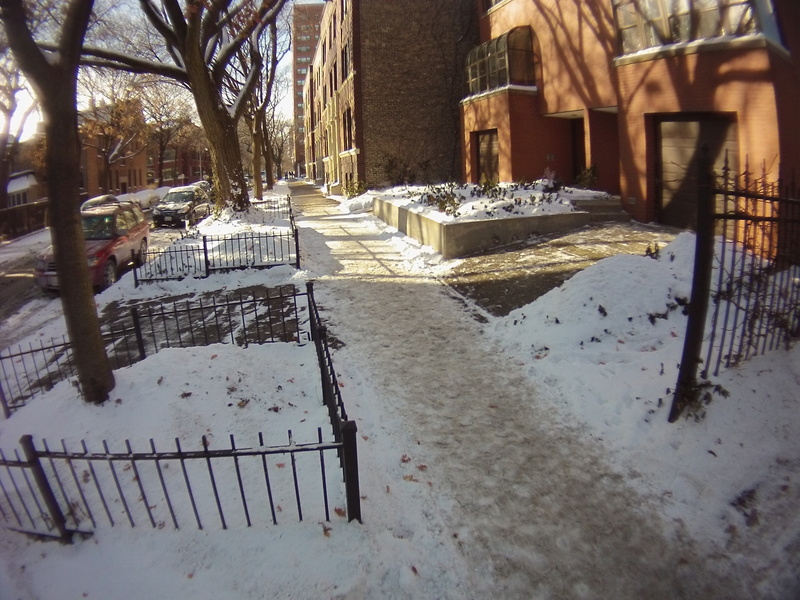 The Windermere apartments provide a positive example having done a wonderful job keeping their sidewalks clear. 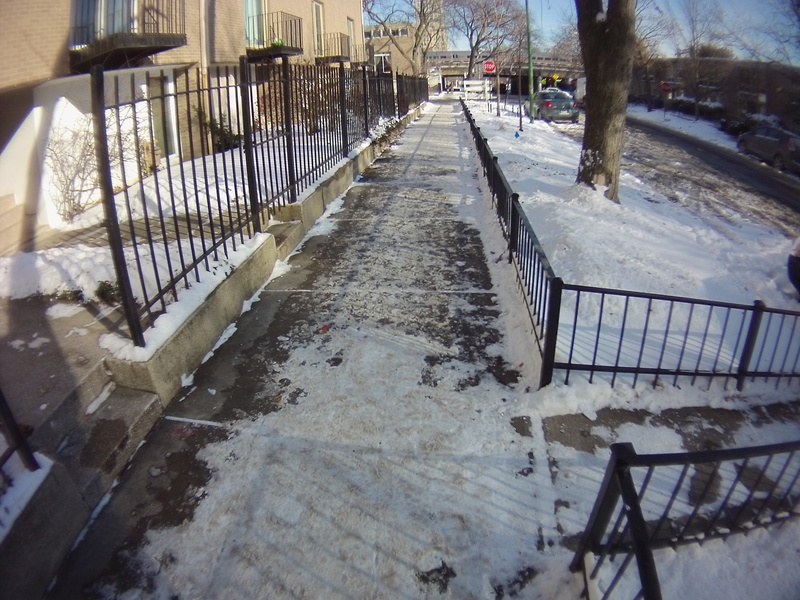 Fully cleared sidewalk at the Windermere Apartments. While some private residences had shoveled or hired someone to do snow removal, many efforts have failed to remove packed snow, especially on busy routes or have attempted to remove large amounts of snow solely with salt. Poorly shoveled snow on 55th St. east of Blackstone. Salt has melted some snow along the left edge of the sidewalk. This is one of the busiest walking routes in Hyde Park. Often, driveways were cleared better than the sidewalks. Snow has been cleared on the driveway here, but not the sidewalk. The snow seems to have been packed down before shoveling occurred. UPDATE: This sidewalk was cleared the day after this post was published. 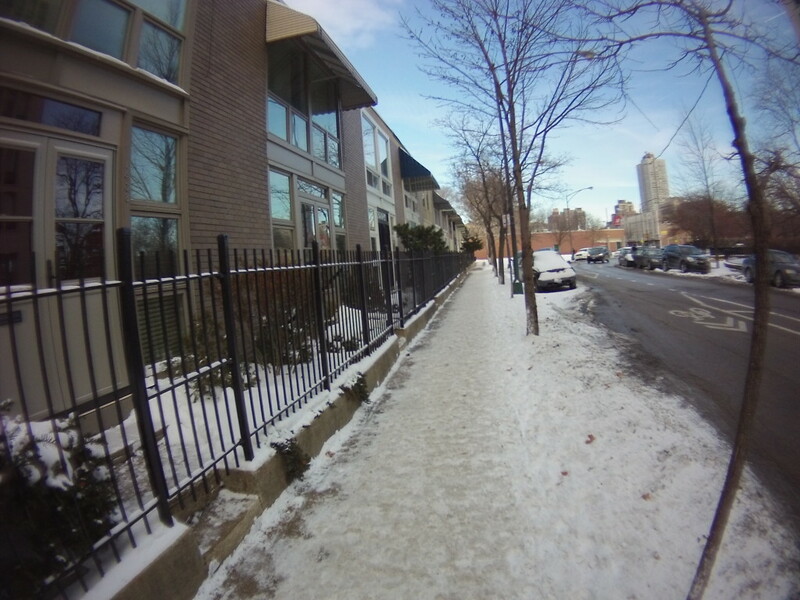 The worst snow on sidewalks is on city owned properties. At schools, underpasses, small parks, pedestrian islands, and alleyways, snow remains uncleared. 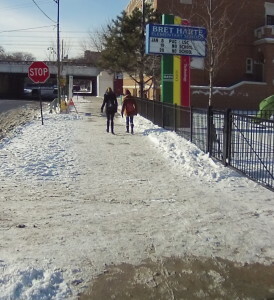 Snow has been only partially cleared from the sidewalk at Bret Harte Elementary. 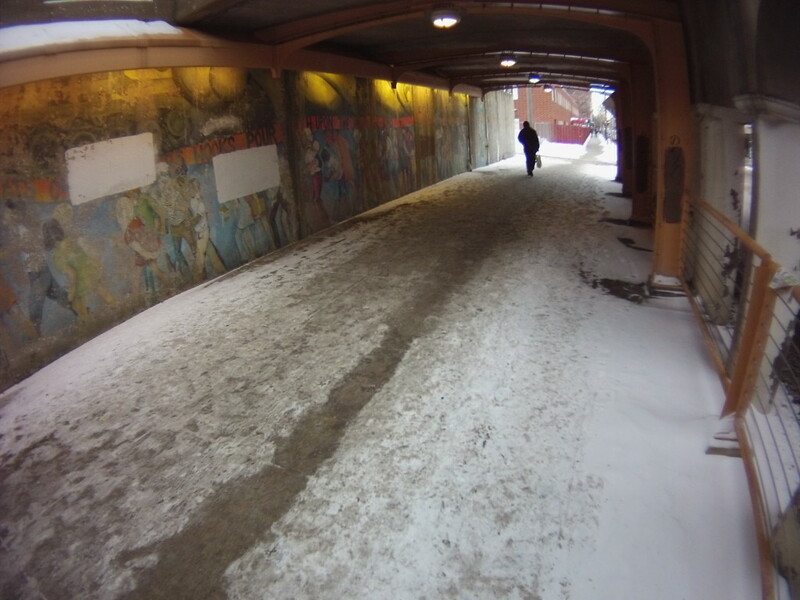 A path has been trampled through the blown snow along 55th St. under the Metra Electric. Snow clearance stops at an alleyway entrance. A trampled path through one of four parcels of Chicago Park District land surrounding the University Park Apartments on 55th St. These locations will become icy in the coming days as temperatures warm up and feet continue to pack the snow. CDOT is aware of these issues and their responsibility to clear snow, but have not yet developed a plan to clear the sidewalks. 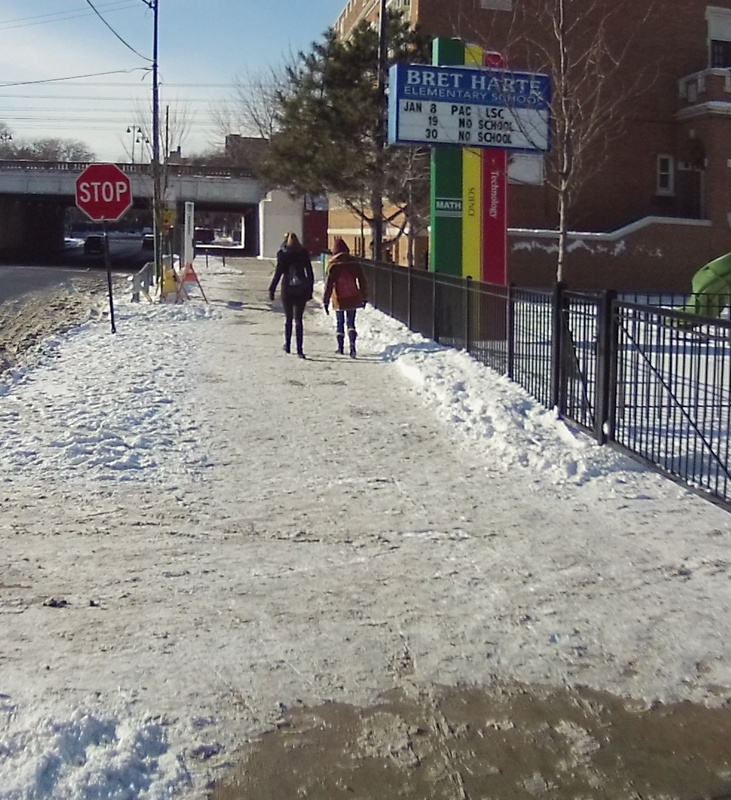 Some factors increase the likelihood that a sidewalk would be cleared. Most importantly, if a property has maintenance staff or can contract out snow clearance, snow removal is generally rapid and of high quality. 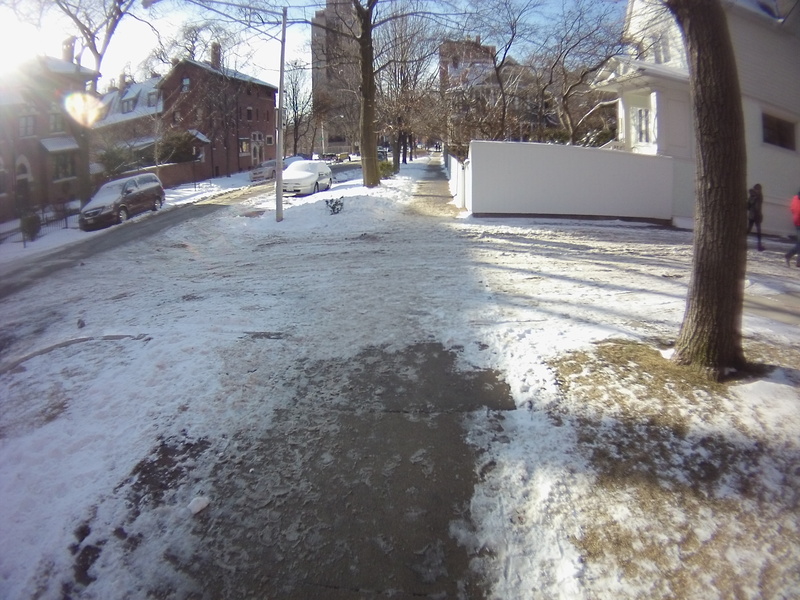 If other sidewalks are well cleared on the same block, private residents are more likely to fully clear their segment. Compliance is low for vacant buildings and single-story condo owners, many of who have less than 20′ of sidewalk to clear. 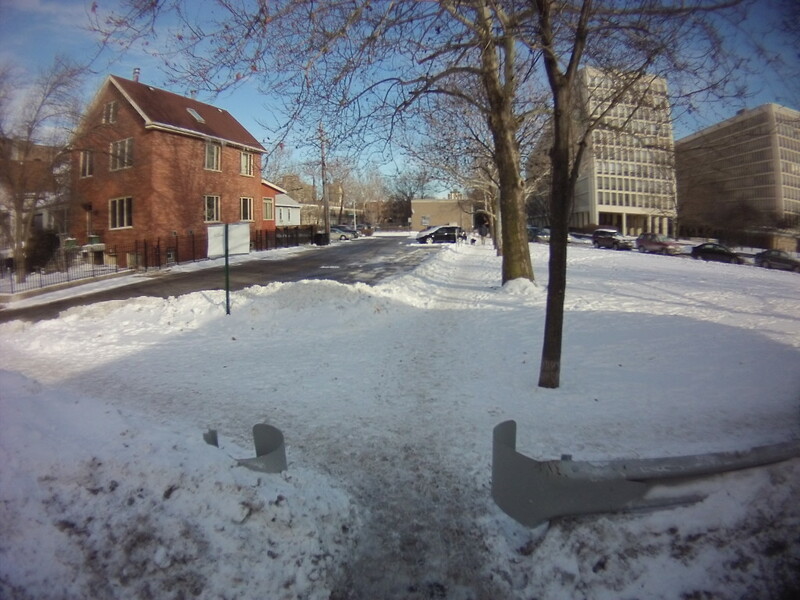 The City of Chicago has two campaigns to match volunteers with sidewalks in need of clearance: the underused Adopt-a-Sidewalk website and the Snow Corps. Both programs require volunteers to own their own snow clearing equipment and supplies. Many potential volunteers in the most pedestrian friendly areas on the city live in apartment buildings, including myself, and thus have no need to own snow clearing equipment. This year, the city is also seeking nominations to recognize businesses and organizations that do a superb job keeping sidewalks clear. The Active Transport Alliance also has a flier campaign to encourage sidewalk clearing. While many programs encourage sidewalk clearing, enforcement of the bylaw is sparse. Through 311, citizens can report uncleared sidewalks and have an inspector talk to the building owner or manager. As not everyone is physically capable of clearing snow and cannot afford to hire someone, strict enforcement with a $50 dollar fine has been politically discouraged. While some hardship situations may be responsible uncleared sidewalks, today I had found many properties where an effort was made to clear snow somewhere, but the public sidewalks remained snowy. I started counting on my 1 mile walk home tonight from the California Blue Line station to Wellington. Property owners were demonstrating 100% compliance until I got north of Logan Boulevard where I counted about 25 derelict property owners on a walk that has, probably, 150+ properties (1 mile/5280 feet divided by 25 feet wide properties minus the streets). IDOT didn’t clear the snow from under the Kennedy Expressway (I presume it’s their job because they own the ground I’m walking on and they have signs saying this is all IDOT property. I was surprised when I saw that snow was clear under here a week or two ago. No idea if they did or someone else.